Happy Superbowl Sunday! Are you guys going to watch the game tonight? I doubt I will - was a bit under the weather the past few days and have stuff to work on to get caught up in school, alas. But that doesn't mean I can't join in on the fun with team color manis! Now I don't really have a preference among the two teams - but when I saw that Colors by Llarowe was going to have two Superbowl sets I totally fell in love with the Seahawks set - so I guess that means I'm cheering for Seattle tonight! Seahawks Lime is a lime green linear holo. The holo is super strong for this one! I love lime greens - as you can see I have a touch of the lobster thing going on in my shade picture, but I don't think it looked that bad in person, and it didn't show up at all in sun. 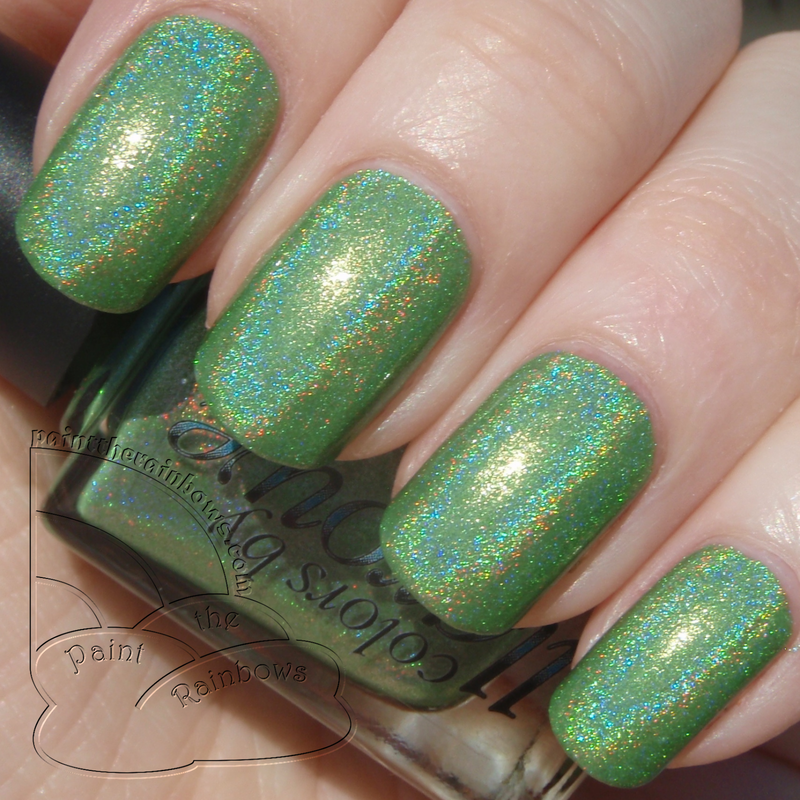 Application was like all CbL holos like this - a bit thick but easy to manage. 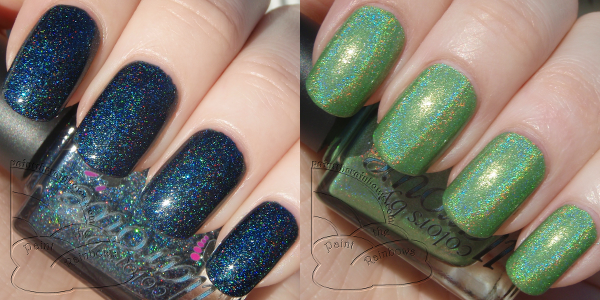 Legion of Boom (or Legion of Doom, lol, as I originally thought it was) is a dark teal-leaning blue packed with silver, blue, and lime microglitter. This polish is kind of hard to describe - I think it is primarily made of glitter in a jelly base? but in the sun it gives off the effect of a blindingly rainbowtastic scatter holo. I adore this polish to bits! I love the slight green cast, since I have a lot of bright blue glittery polishes but none this shade of sorta-teal. And of course I just can't get enough of this polish's sparkle! Application was no trouble here either; could have gotten away with just two coats but did three since I forgot to wrap my tips at first. Also I think I could have just one coat of topcoat to smooth out the texture, but I did two just to be safe. Totally loved both of these! Gorgeous colors that match the Seahawks perfectly. Glad I will have the perfect mani on tonight - even if I can't watch the game I will be celebrating in glittery style. To check out Colors by Llarowe check out the Llarowe site and Facebook - and the brand new Colors by Llarowe page on Facebook as well! Looks like you picked the right team to support today. What pretty manis.